Artist MJ Caselden is using electroacoustic sculptures to offer immersive sound baths of deep, subtly shifting, and humming tones at Manhattan’s apexart gallery. In recent years, meditation sessions guided entirely by sound have become increasingly popular. Known as sound baths, they invite participants to simply lie down on mats while soothing instruments such as singing bowls, tuning forks, and gongs chime softly throughout the entire session. They speak to the healing power of sound; chances are you’ll find a meditation center, yoga studio, or spa near you that offers them. Until mid-December, New Yorkers will also find them in an art gallery: apexart is hosting bi-weekly sound baths led by artist MJ Caselden, who replaces traditional instruments with his own sound sculptures that produce ambient noise through vibrations. 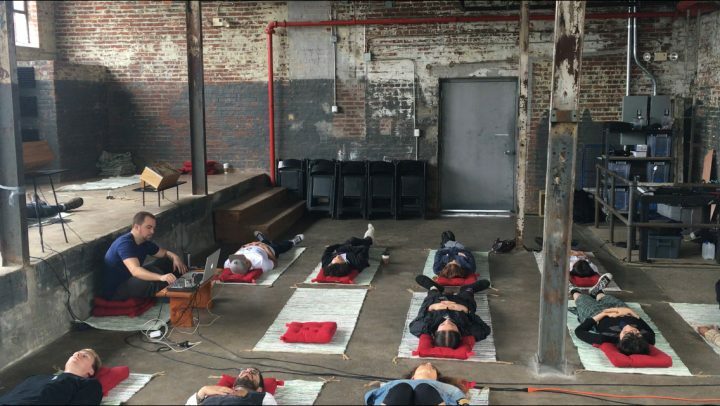 Previously offered at the New Museum as part of NEW INC’s end-of-year showcase and at the Knockdown Center during Machines in Music, Caselden’s sound baths are currently part of Youniverse, an exhibition organized by hannes bend that explores experiences related to human consciousness and communication. Works on view throughout its run include a VR meditation experience and a video exploring how hearing-impaired individuals can sense the music of whales. 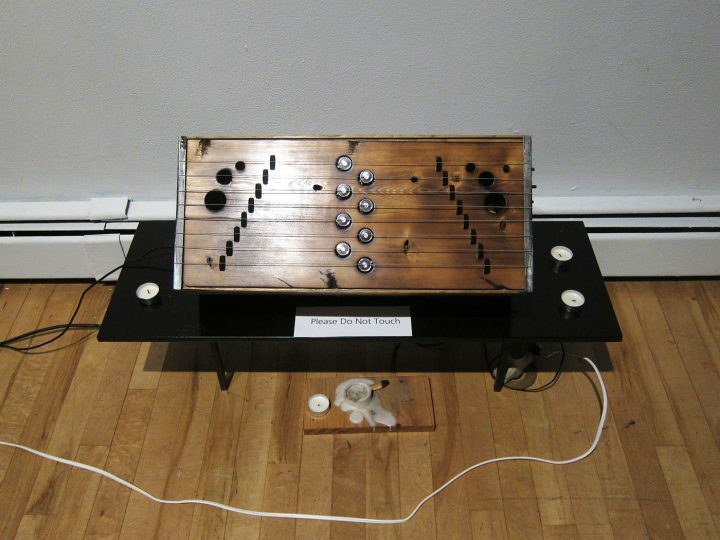 Caselden calls his sessions “magnetic sound baths” as they incorporate his specially designed technology: the electroacoustic sculptures, constructed of wood and strung like traditional acoustic instruments, move autonomously once switched on, generating magnetic fields that push and pull on the strings. These vibrations then travel through the chamber, creating a deep, textured hum of subtly shifting notes. I attended one on a recent evening; it was two days after we learned that the future leader of the United Stats will be a racist, misogynist, bigoted desiccated carrot with no presidential strategy except to tweet in garbage exclamations — in short, I needed a moment of calm and harmony. For 50 minutes, I lay, shut-eyed, in the gallery’s main room with about 15 others as the sonic waves washed over us all. I sensed Caselden, towering over the group, snaking through our mats, at times shaking another percussive, wooden instrument — but I quickly lost track of his actions, as the thick thrum of the dozen or so metal strings filled the enclosed space and wormed into my ears, the sustained notes eventually fogging my mind. 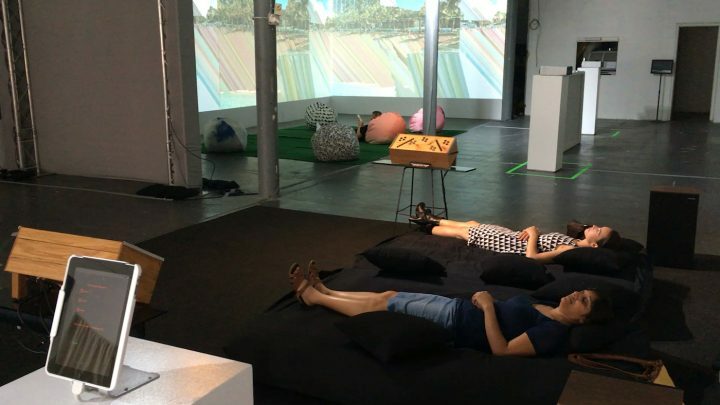 An installation like the pink-washed Dream House immerses visitors in a similar, buzzing sound for as long as they wish, but I found my timed magnetic sound bath more transportive. I felt disjointed from my physical surroundings and detached from heavy thoughts; my body seemed buoyant and connected only to the many layered vibrations, which, rather than simply aural, seemed tangible. I felt akin to one of those thin metal strings, as if I were quivering gently but with complete stability. When the session ended, I was still physically tired, but my mind felt clear and ready to focus. You might liken sound baths to the pose of shavasana — the final, restorative position you take during yoga, also known as corpse pose — but the feeling of relaxation brought on by a sound bath, for me, was much more intense. Caselden’s vibration-heavy version, specifically, effectively constructed with cyclical sound a maze-like headspace: I felt distant from the gallery, like I was roaming elsewhere, yet still aware that I was part of this communal wandering. This is what sets sound baths apart from other popular, technology-based options that aim to relieve stress, from sensory deprivation tanks to cryotherapy machines. The latter therapies are private and isolating; the experience at apexart, in particular, situates you within a more vulnerable, public setting among strangers — and the exhibition remains up around you as a reminder of the gallery’s traditional function as a room for display. Is it art, though? Especially in this current climate of political uncertainty, I don’t think that really matters. Caselden’s magnetic sound baths — besides offering temporary relief from the news, Facebook, Twitter, and other sources of common anxieties — remind of the role cultural institutions have in creating safe spaces for members of their communities to find solace together during particularly heavy times. When the election results rolled in, many art organizations opened their doors to invite conversation and provide space for people to gather and heal. The magnetic sound baths at apexart may not have been planned as election relief, but the opportunity for self-care they offer is nevertheless very poignant. Granted, it’s a more quiet and introspective one, where people connect through a communal soundscape; where sound is the acknowledged tool that delivers psychological stability, even if only for just a moment. 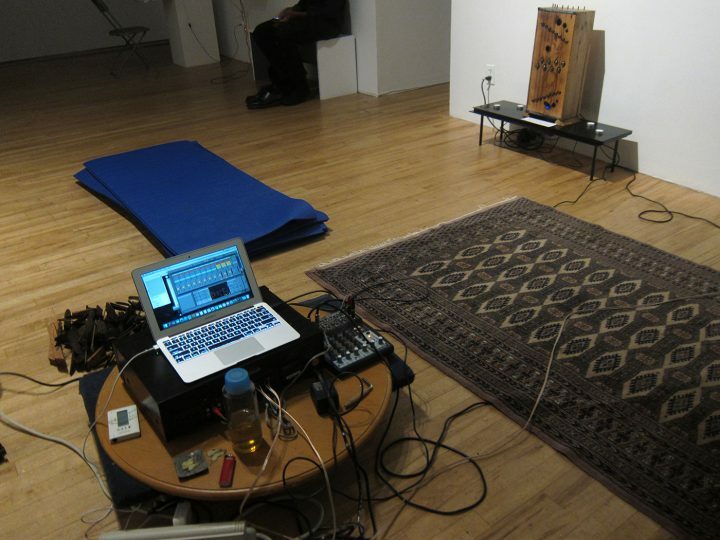 MJ Caselden’s Magnetic Sound Baths continue every Tuesday and Thursday at apexart (291 Church Street, Tribeca, Manhattan) through December 15.